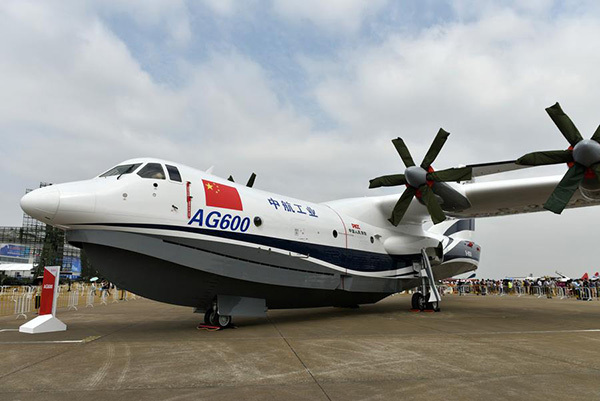 The world's largest amphibious aircraft, the AG-600, will carry out its maiden flight "very soon", according to Aviation Industry Corp of China, the plane's developer. The State-owned aircraft giant said on its WeChat account on Tuesday that it held two meetings in Zhuhai, Guangdong province, from Friday to Sunday to review the quality and condition of an AG-600 that will be used in the first flight test. Experts at the meetings unanimously agreed the aircraft is ready for a flight test, the release said. It noted that the test will take place "very soon", without giving a timetable. China Aviation Industry General Aircraft, an AVIC subsidiary in Zhuhai, launched the AG-600 project in September 2009, aiming to fill the vacancy for an amphibious plane in China. The Chinese Navy once had a handful of SH-5 maritime patrol amphibious aircraft but has reportedly decommissioned all of them. The company said it has received orders for 17 AG-600s from Chinese government departments and domestic companies. The seaplane has a maximum takeoff weight of 53.5 metric tons, an operational range of about 4,500 kilometers, and a size roughly comparable to that of a Boeing 737, which makes it the world's largest amphibious aircraft, surpassing Japan's ShinMaywa US-2 and Russia's Beriev Be-200, according to Huang Lingcai, AG-600's chief designer at China Aviation Industry General Aircraft. He said the seaplane will play an important role in forest fire control, maritime search and rescue, personnel and supply transport to islands as well as law enforcement tasks on the sea. The designer noted that it can fly a round trip between Sanya in Hainan province and the shoal of Zengmu Ansha, the southernmost point of China's territory, without refueling. Powered by four turboprop engines, the AG-600 is capable of carrying 50 people during a maritime search-and-rescue mission. To extinguish forest fires, it can collect 12 metric tons of water from a nearby lake or sea within 20 seconds, information from the company shows. Aviation industry observers said seaplanes are very suitable for maritime search and rescue because they can land both on islands and on the surface of the sea, and this advantage makes them flexible in use and gives them longer operation time compared with ordinary aircraft.